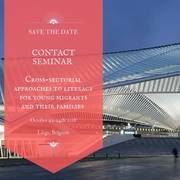 AEF-Europe, the Erasmus+ National Agency for French-speaking Belgium, is pleased to announce that the International Contact Seminar on “Cross-sectorial approaches to literacy for young migrants and their families” will take place in Liège (Belgium), from October 22nd to October 24th, 2018. Be willing to exchange good practises and create partnerships for future KA1/KA2 Erasmus+ projects either as sending or receiving partners. Both newcomers and those with experiences of Erasmus+ projects within the defined topic are welcomed. The event is free of charge for participants: AEF-Europe will cover travel fees and will offer the accommodation at Les Comtes de Méan. If you are interested in participating, please fill in the attached "Formulaire de candidature" and send it to tca(at)aef-europe.be before September, 14th.